• A Tudor-era bowling ball, Roman iron horse shoes and late 19th century ginger jars are among hundreds of historic objects unearthed during the Crossrail construction project to go on show at the Museum of London Docklands tomorrow. Tunnel: the archaeology of Crossrail presents highlights from among the more than 10,000 objects which have been discovered during the project, the largest infrastructure project currently underway in Europe, since it kicked off in 2009. The finds, which span 8,000 years of human history, also include prehistoric flints found at North Woolwich, medieval animal bone skates and human remains found in the former 17th century Bedlam cemetery. The objects, which can be seen until 3rd September, are displayed in accordance to where along the new Elizabeth line they were found. Entry is free. For more, see www.museumoflondon.org.uk. 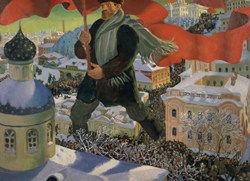 • This year is centenary of the Russian Revolution and to mark the occasion, the Royal Academy of Arts in Piccadilly is hosting a landmark exhibition on Russian art which takes in the period between 1917 – the year of the October Revolution – and 1932 when Josef Stalin began his violent suppression of the avant-garde. Revolution: Russian Art 1917-1932 features the works of the likes of avant-garde artists Marc Chagall, Wassily Kandinsky, and Kazimir Malevich and social realists like Isaac Brodsky and Alexander Deineka. More than 200 works are on show including loans from the State Russian Museum of St Petersburg and the State Tretyakov Gallery in Moscow, many of which have never been seen in the UK before. Highlights include Chagall’s Promenade (1917-18), Kandinsky’s Blue Crest (1917) and Malevich’s Peasants (c. 1930). Alongside the paintings, the display features photography, sculpture, film, posters and porcelain. Admission charge applies. Runs until 17th April. For more, see www.royalacademy.org.uk. PICTURE: Boris Mikailovich Kustodiev, ‘Bolshevik’ (1920) © State Tretyakov Gallery. • More than 100 robots are on display at the Science Museum in South Kensington as part of a new exhibition spanning 500 years of robotic history. Robots, which explores how robots have been shaped by religious belief, the industrial revolution, 20th century popular culture and dreams of the future, features everything from a 16th century mechanical monk to a 2.4 metre tall robot named Cygan dating from the 1950s, and one of the first walking bipedal robots. Visitors will be able to interact with 12 working robots and go behind the scenes to see recent developments in robotic research as well as speculate on what robots of the future might be like. Admission charge applies. Runs until 3rd September. For more, see www.sciencemuseum.org.uk/robots. • A major exhibition celebrating the work of early 20th century UK modern artist Vanessa Bell – a central figure in the so-called ‘Bloomsbury Group’ – has opened at the Dulwich Picture Gallery in London’s south this week. About 100 oil paintings as well as ceramics, fabrics, works on paper, photographs and related archival material are featured in the exhibition with the works arranged thematically so as to reveal Bell’s “fluid movement” between the fine and applied arts and focusing particular attention on her most distinctive period of experimentation from 1910 onwards. Vanessa Bell, which runs until 4th June, is presented alongside a photography display which brings together Bell’s photographic work with that of American musician, writer and artist Patti Smith. Legacy: Photographs by Vanessa Bell and Patti Smith features 17 photographs by Smith – who has long found inspiration in the work and lives of the Bloomsbury Group – and a selection of Bell’s photo albums. Both can be seen until 4th June. For more, see www.dulwichpicturegallery.org.uk. 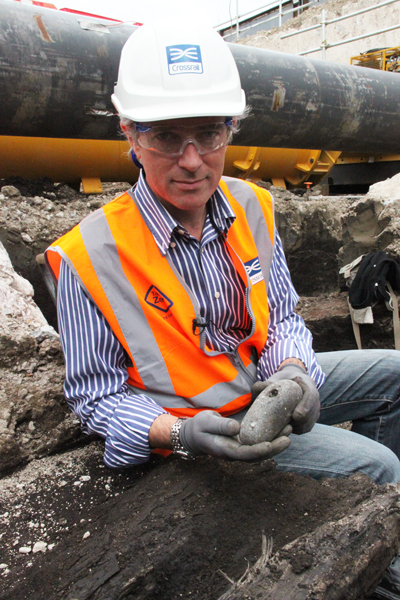 Crossrail’s lead archaeologist Jay Carver holding a hammer stone which is among the first Bronze Age finds uncovered during the £14.8 billion rail project. The discoveries, uncovered at the Plumstead tunnel entrance site in East London (not far from Belmarsh Prison), also included two wooden stakes that may have been cut by early hunters with an axe and which may have been used in the building of a timber path, part of a network which allowed hunters to access wetland areas about 3,500 years ago. Previous objects found at Crossrail project sites include human bones from the medieval period, a find of rare amber and a piece from a mammoth’s jaw bone. The latest finds, which are now being examined by Museum of London Archaeology, were made as a month long exhibition opens at Crossrail’s Tottenham Court Road Visitor Information Centre (16-18 St Giles High Street), displaying previous objects found during the project. Meanwhile, as part of the exhibition, Mr Carver will also host a Q&A session on Twitter (#BisontoBedlam) today between 2pm and 9pm during which he will answer questions on Crossrail’s archaeology programme and the exhibition. Crossrail, Europe’s largest construction project, will see the construction of a new rail link running along a 73 mile route across the city. For more on Crossrail, see www.crossrail.co.uk. PICTURE: Courtesy of Crossrail.